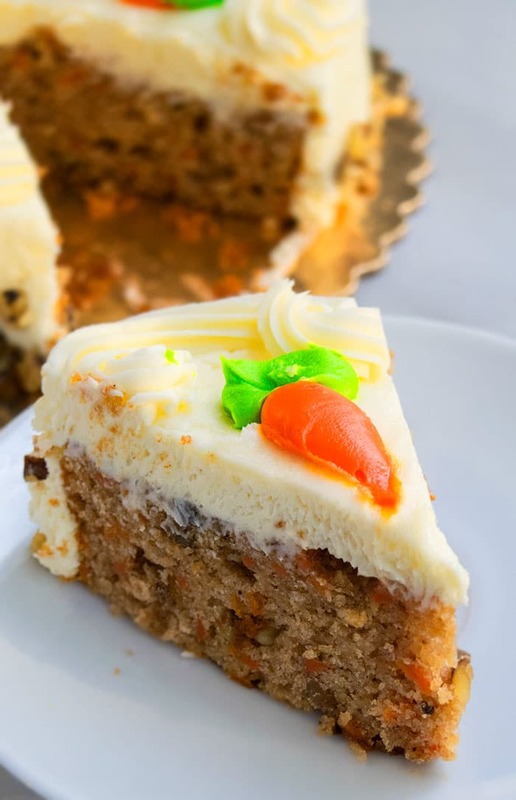 The best, classic, spiced soft, moist, quick and easy carrot cake recipe, homemade from scratch with simple ingredients. Covered in cream cheese frosting! After countless trial and errors, I have the perfect Easter cake to share with all of you. It’s packed with wonderful spices like nutmeg and cinnamon. 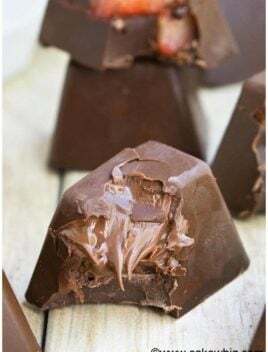 I am not too fond of cloves and omit that but if you like that, feel free to add some in this recipe. 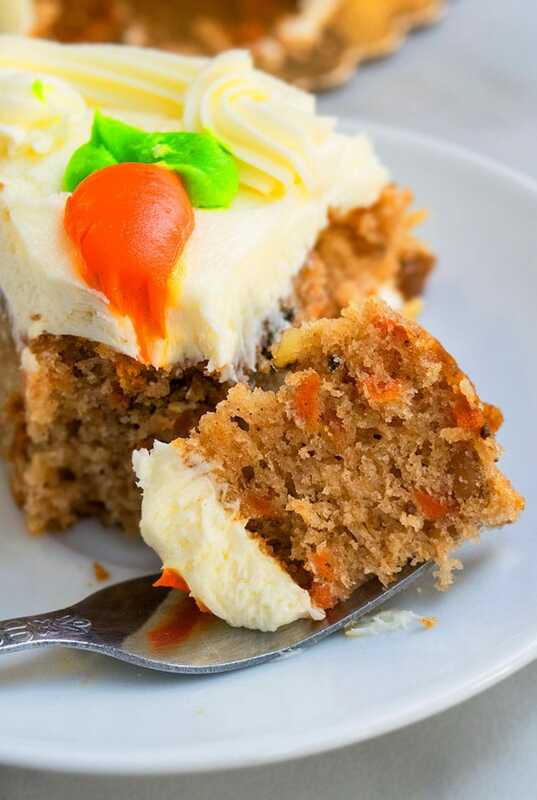 This SIMPLE carrot cake recipe is made with BASIC ingredients that I bet you already have in your kitchen pantry. People have strong feelings about the use of pineapples and nuts in this cake. Some people love them and some hate them. Based on my research, carrot cake with pineapple and nuts, especially walnuts is the CLASSIC version. 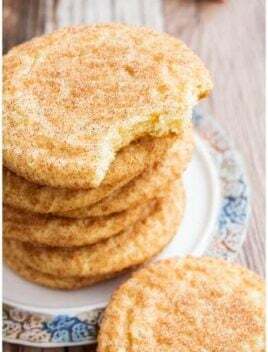 I know this cake is usually considered to be an Easter cake or Easter dessert but honestly, it can be enjoyed throughout the year at birthday parties, anniversaries, weddings and other celebrations. 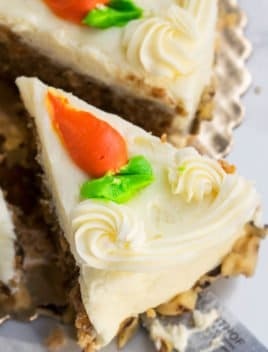 I combined 3 family recipes to come up with this TRADITIONAL carrot cake with cream cheese frosting recipe. It even got the seal of approval from my Mom and Grandma, who are both excellent bakers. 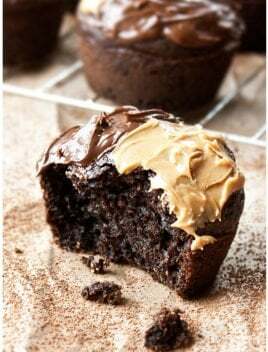 Don’t replace granulated sugar with brown sugar. 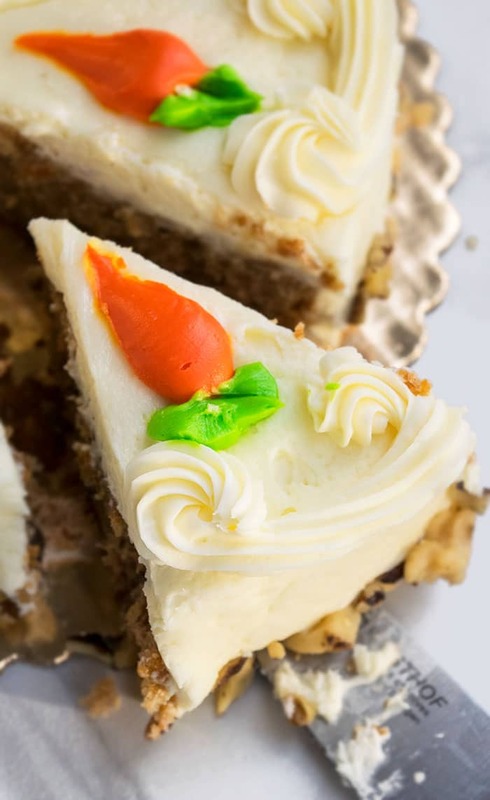 Both, baking powder and baking soda, are used in this easy carrot cake recipe. Do not omit one with the other. Make sure your oven is calibrated properly so that the cake bakes evenly at the proper temperature. 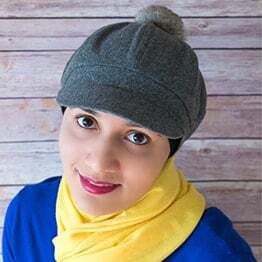 Recipe can easily be doubled to make a layer cake. Don’t use small eggs in this recipe. It didn’t give the same results. Large eggs must be used. If you add 1 tsp orange extract, it will add an incredible fruity flavor to this cake. 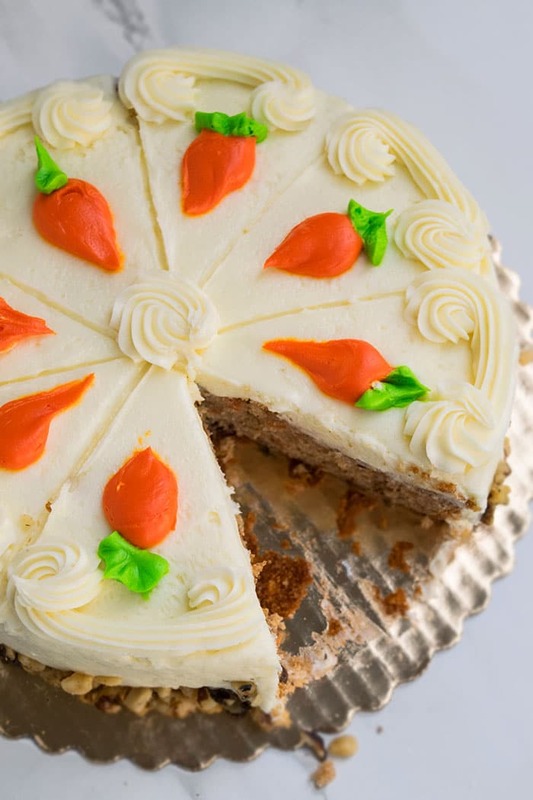 This spiced soft and moist carrot cake recipe from scratch with cream cheese frosting is easy to make with simple ingredients. Perfect Easter dessert. In a large mixing bowl, add eggs, oil, vanilla extract, sugar and mix until smooth. Keep aside. 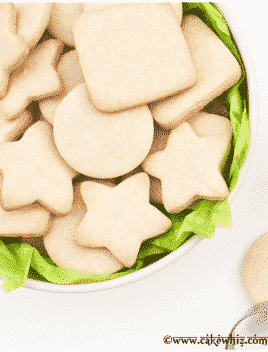 In a separate bowl, whisk together flour, baking powder, baking soda, cinnamon, nutmeg, ginger. Dump this dry mixture into the wet mixture, along with the carrots and mix until just combined. Pour batter in a greased/ floured round cake pan (Dimensions: 9x2). Bake at 350 degrees for 40-45 minutes or until an inserted toothpick in the center comes out clean. Allow the cake to cool down completely. Then, ice it in cream cheese frosting. 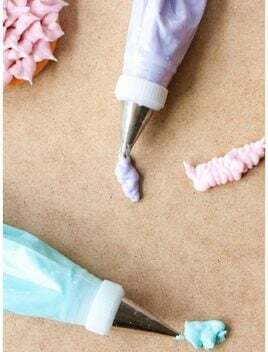 Decorate, using the round tip and star tip. Sprinkle chopped walnuts along the bottom of the cake. Enjoy! Leftovers can be stored in a covered container in the fridge for up to 3 days. Hi! 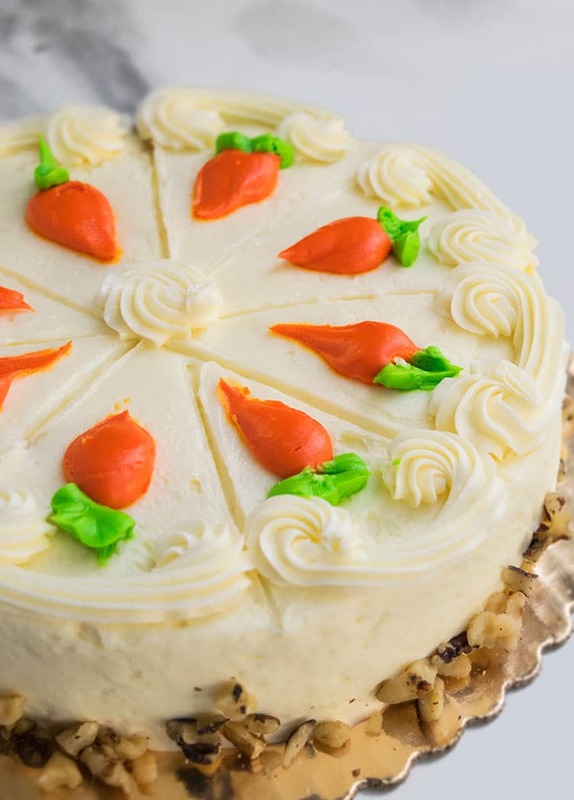 I can’t wait to make this carrot cake! I love that it has no raisins or pineapple! One question: will the cream cheese recipe yield enough to ice this cake if I double the cake recipe and make a two-layer cake? Thank you! I hear ya… nothing ruins a cake for me faster than those pesky little raisins. lol. My cream cheese frosting recipe yields 3 cups. I think that should be enough for icing a layer cake if you are not doing a super thick layer. I usually prefer 4 cups of frosting for layer cakes because I crumb coat first but not everyone does that. What is a good replacement for the walnuts, or can they just be left out? 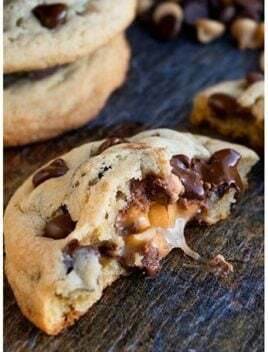 They can be left out or you can replace them with pecans too.